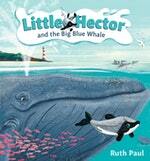 Fun facts about the Hector's Dolphin from Little Hector and the Big Blue Whale. You can also find this inside the back cover of Little Hector and the Big Blue Whale. Buy a copy of Little Hector and the Big Blue Whale, and receive your very own Little Hector plush!